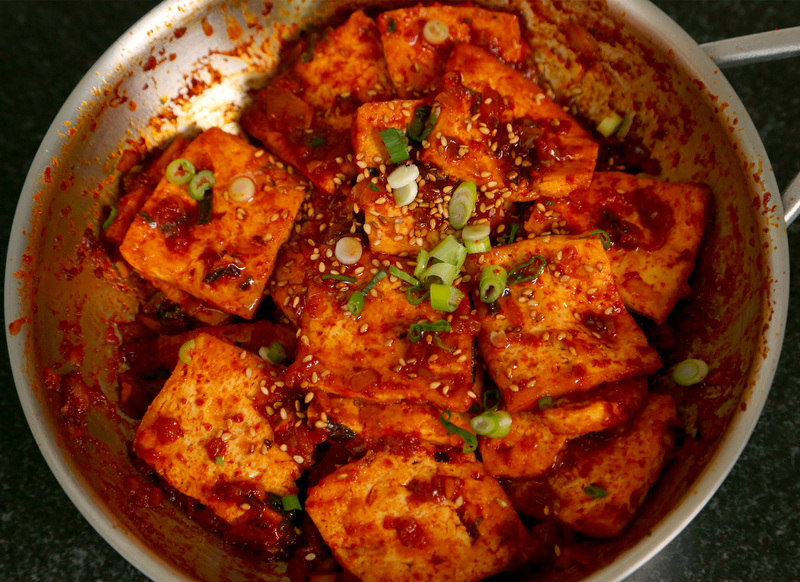 Today’s recipe is dubu-jorim (spicy braised tofu). It’s tofu braised in a savory-spicy sauce and pan fried with caramelized onion, garlic, and green onions, making it juicy, a little spicy, crispy on the outside and soft on the inside. It’s a delicious side dish for rice, noodles or porridge, and tastes meaty even though it’s a totally vegetarian dish. This is something you can easily put together in a short amount of time that will please pretty much everybody, and especially vegetarians. You can refrigerate any leftovers for up to 3 to 4 days! This dish is good hot or cold, so you don’t even need to heat it up again if you don’t want to, just bring it out and serve. It’s also a standard in Korean dosirak (lunchbox) item because it keeps well until lunchtime and it gives any meal a little kick. Enjoy the recipe! Rinse tofu in cold running water and dry it with cotton or paper towel. Cut it into ¼ inch thick bite size pieces. Add the cooking oil to a non-stick pan and heat it up over high heat. Gently set the tofu onto the pan and cook for 7 to 8 minutes. Rotate the pan to cook the tofu evenly. When the bottoms get a little crunchy, flip them over one by one with a spatula. Let cook another 7 to 8 minutes until both sides of each tofu piece are a little crispy and golden brown. Transfer the tofu to a plate. Keep the leftover oil. Heat up a small pan over medium high heat and add the leftover oil. Add chopped onion, garlic, and green onion (less 1 tablespoon, to be used for a garnish later). Stir with a wooden spoon for a few minutes until the onion gets a little crispy. Add the sauce and keep stirring until it reduces a bit and thickens. Add tofu and braise for a minute until the tofu absorbs some of the flavor of the sauce. Add some sesame oil and stir. Sprinkle some sesame seeds over top and the rest of the chopped green onion. Serve right away with rice. Posted on Monday, February 15th, 2016 at 6:42 pm. Posted May 31st, 2016 at 6:22 pm | Log in to reply. What firmness of tofu do you recommend? Firm? Medium? Thanks so much! Posted May 31st, 2016 at 10:29 pm | Log in to reply. I use medium firm tofu. Good luck! Posted May 27th, 2016 at 12:48 am | Log in to reply. This recipe makes a great lunch when I’m at school and trying to stay awake and focused! PS: While I was cooking this my whole family (who hates tofu and spicy food) kept saying “what smells good? ” Then my dad tried it and loved it who always said he hated tofu! Posted May 27th, 2016 at 4:06 pm | Log in to reply. Posted May 2nd, 2016 at 4:30 am | Log in to reply. i heard you can enhance this dish by coating the tofu with flour and egg before pan frying. is this true? have you tried it before? Posted April 2nd, 2016 at 12:01 pm | Log in to reply. Posted April 4th, 2016 at 6:43 pm | Log in to reply. Posted March 31st, 2016 at 4:11 pm | Log in to reply. I made this yesterday. Very easy and very tasty. I think I cut my tofu too thin or else my oil was too hot because it cooked to golden brown in more like 3 minutes per side. I can’t wait to make more Korean food! Posted March 22nd, 2016 at 9:00 am | Log in to reply. Thank you for all the yummy recipes. I made the braised spicy tofu last night and I’m having it for lunch too! Posted March 22nd, 2016 at 8:16 pm | Log in to reply. Posted March 22nd, 2016 at 3:44 am | Log in to reply. Hi~ Maangchi, your recipes are so wonderful. In my opinion, all recipres from Korea must be hard to do but it seems i was wrong. Thank you very much for all gorgeus and tasty recipes. Posted March 13th, 2016 at 6:29 pm | Log in to reply. Very easy to make. I cooked the tofu in two batches and then braised it together as one batch. Even my mother who had said she would never even try tofu ate it and actually asked for a bit more on her plate. I cut the tofu more into strips than squares so it had more crispy edges. Was also tasty cold the next day at work. Posted March 6th, 2016 at 5:16 pm | Log in to reply. I love your videos Maangchi! Thank you for showing us how to make Korean dishes, and especially thank you for giving us substitutions if we don’t eat meat or we need to make something less spicy! Posted February 28th, 2016 at 6:30 pm | Log in to reply. Posted February 29th, 2016 at 12:51 pm | Log in to reply. It looks very tasty! Great photo,too! Posted February 29th, 2016 at 5:44 pm | Log in to reply. Posted February 28th, 2016 at 9:06 am | Log in to reply. Me encantan tus recetas gracias por colocar subtitulos en espanol. Posted February 24th, 2016 at 11:34 am | Log in to reply. I used chilli powder because I didn’t have pepper flakes. Now it’s not as red but it still tastes very good. Posted February 20th, 2016 at 4:03 am | Log in to reply. Posted February 20th, 2016 at 3:30 pm | Log in to reply. I’m glad you and your sister like this recipe. It looks wonderful! I make this very often. Posted February 17th, 2016 at 5:53 am | Log in to reply. For how many servings is this recipe? I have only 250 grams tofu and I’ll do it for today’s dinner with some chicken and maybe rice, or noodles. Will this amount of tofu be ok for three servings? Posted February 16th, 2016 at 11:11 am | Log in to reply. Thank you so much for all your gorgeous recipes!!! Can I ask you for the brand of the indoor small butane gas stove you use in your videos? I want to get one for myself also! This recipe was originally posted on February 15, 2016 at 6:42 pm by Maangchi. The video was watched 2,532,760 times on YouTube & has 52,935 likes!